Guidebook to 44 varied day walks and over 100 summits in the Southern Uplands of Scotland, stretching south-west from Edinburgh to the English border, including the Galloway and Pentland Hills. Between 2 and 29km, there is something for all seasons and all abilities in remote and rugged hill country. 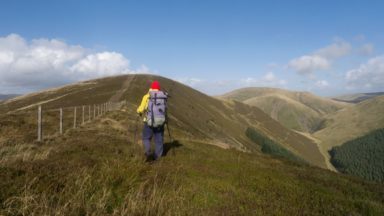 This guidebook describes 44 routes and over 100 summits across the Southern Uplands of Scotland, stretching south-west from Edinburgh to the English border, including the Galloway and Pentland Hills. The walks range between 2 and 18 miles, suitable for walkers of all abilities. Highlights include Merrick and the Galloway Hills, Hart Fell and the Devil’s Beeftub, Cheviot and the Border Ridge, Arthur’s Seat and the River Tweed. The Scottish Southern Uplands is a range that is about as big as the English Pennines. It is wild hill country, with over 80 hills of 2000ft or more, and it boasts a real remoteness that is difficult to find elsewhere. All hillwalkers should experience these wonderfully characterful landscapes: green and gentle, but with hidden surprises and remote escapes. The routes are suitable from spring to autumn, and on winter days with good weather and snow conditions. Each route provides OS mapping, information on distance, ascent, time, maximum altitude and terrain, as well as details of any variants or shortcuts. 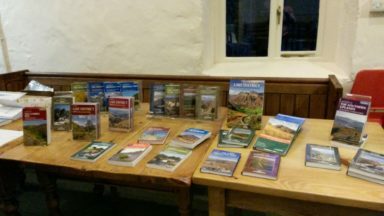 With notes on points of interest along the way as well as on transport and accommodation, the guide gives all the information walkers need. "You can always rely on a Cicerone guide to show you the way, with its clear maps and directions, while also entertaining you with concise stories, inspiring future trips with great photographs and somehow remaining genuinely pocket-sized. This latest offering, subtitled "The best hill days in Southern Scotland", does not disappoint on any count." Find this review in the May/June issue of Scotland Outdoors magazine. 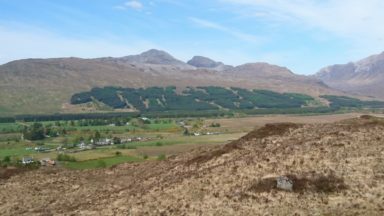 This guide is useful for both the occasional visitor and for someone who wants to explore some of the lesser known and wilder areas of Scotland. The author, Ronald Turnbull, is again an expert in the local area with an in depth knowledge of every nook and cranny and with 44 walks there is something for everyone. ...There is plenty of detail in the walk descriptions and the mapping is detailed enough to warrant leaving the main map behind for short walks. The new style feels fresh and modern and my wife enjoys walking in this type of terrain so the guide has piqued our interest for a short holiday in the region. So all in all another great guide to add to your collection and the area certainly calls for closer exploration. Read the full review on the Climbing Gear Reviews Blog. Multi award-winning guidebook author Ronald Turnbull is not one to mince his words. Somewhat controversially, but entirely typically, he claims the Southern Uplands are the UK's fourth great range of hills, surpassed only by the Lake District, Snowdonia and the Scottish Highlands, in this superb, comprehensive and entertaining guide. There's plenty for Ronald to go at and... all the stories of these walks are beautifully told in Ronald's familiar rollicking style." "Walking these hills offers an opportunity that is hard to find in other remote parts of the UK – the real adventure of wild hill walking, with no one for miles around. 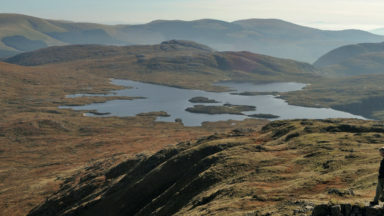 The guidebook provides each walk with a wealth of detail; from distance, timing and ascent information, to the terrain and where to park, all accompanied by annotated OS maps and alternative routes.Other information, such as how to get to and around the area, and advice on preparation and accommodation, or background knowledge on the range’s geology, history and wildlife, is also included. 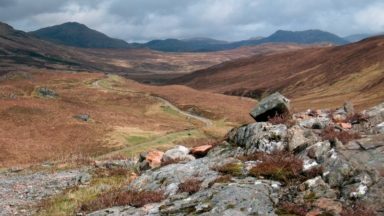 The result is an essential guide to discovering the best of the Southern Uplands." "The book fired me up to visit some of the rolling hills I'd neglected for a while... I really liked this guidebook and it will be in the top of my rucksack when I aim south from Edinburgh!" Read the full review on Steven Fallon's website. "Walking in the Southern Uplands" by Ronald Turnbull is a lovely little book that shows just how good a walking guide can be. Ronald Turnbull is a man whose name and books will be known to anyone who loves the Scottish hills and mountains, and whose knowledge of the subject is deeply impressive. And the books of Cicerone Press are likewise very familiar to and loved by hillwalkers, in Scotland and far beyond it. This book is the first we have seen that takes a new approach by Cicerone. In the past their output could be characterised as "excellent books in rather drab covers". As the cover image shows, they are now giving their books covers that allow them to stand out far better on the bookshelf: and, it might be said, do far better justice to the quality of the contents. For many visitors to Scotland, the Southern Uplands are the hills they drive through on the M74, or glimpse from the A1, while en route to the "real" Scotland. They have been overlooked for far too long, and Ronald Turnbull does much between the covers of this book to help address that neglect. The area it covers includes some of the most remote and quietest parts of Scotland. And now many pub quizzers would know that Scotland's highest village (Wanlockhead) is in Dumfries and Galloway? Or, as the author tells us in his introduction, that there are more than 80 hills over 2,000ft in height in the Southern Uplands? The content begins with an introduction of the sort that is obligatory in walking guides, albeit a well written and informative one. We then move onto 44 sections, each covering a different walk. Each walk comes with essential facts, an often amusing introduction by the author, a route guide, a nicely produced colour map, and a couple of very good colour photographs. The included walks are widely geographically spread across the area. 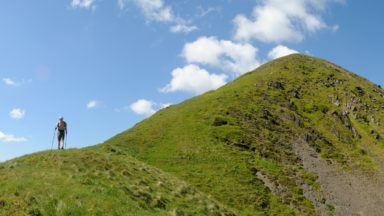 Notable hills such as Merrick, Hart Fell and Cheviot are included, and a particular attraction is the wide variety of the walks on offer, from challengingly long to very short, and from hill climb and ridge walks to river and coastal walks. Plus an island walk, on Ailsa Craig, and, arguably, a city walk, taking in Arthur's Seat in Edinburgh. 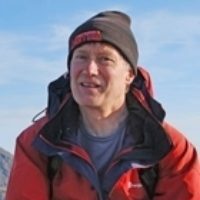 Ronald Turnbull writes regularly for TGO, Lakeland Walker, Trail and Cumbria magazines. His previous books include Across Scotland on Foot, Long Days in Lakeland and Welsh 3000ft Challenges. He has written many other Cicerone guides, including Walking in the Lowther Hills, The Book of the Bivvy and Not the West Highland Way.